If a poll is made in Nigeria on which is the best travel agency in the country with excellent services, it is very certain that Zidora Group will not struggle for the number one person while others jostle for the other spots. This is because those in the industry know that the services rendered by the firm are second to none. In fact, Zidora Travels & Tours is reputed for quality services, modern and effective approach to problem solving and when traced to the root, one will not be surprised because the founder, Dr Arinze Harrison Madueke, is a seasoned medical doctor, entrepreneur and philanthropist, who has done well for himself in his chosen profession. Zidora group also has vast interests in education, agriculture and food services, oil and gas, dredging and mining, real estate, pharmaceuticals and chemicals. 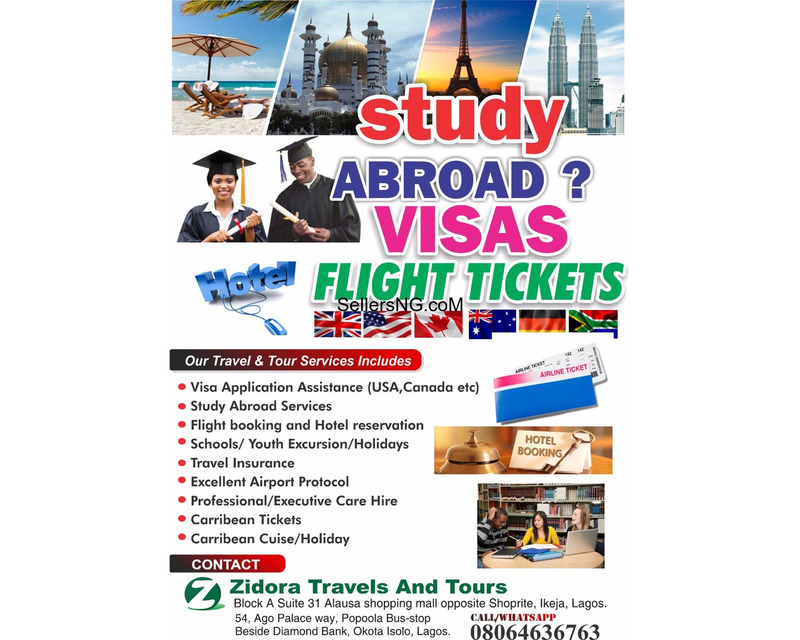 Zidora Travels and Tours is a travel agency that provides quick and reliable visa packages and all, travel services to their clients. Their visa packages include Tourist Visa; Work Permits (Canada, Australia, Dubai, Qatar and USA); Study abroad services; and medical visa. The firm also assist pregnant women who are interested in giving birth in the United States acquire their visa, as well as help in accommodation and logistics assistance, and doctor’s appointment for point of entry purpose. The company also offers assistance in visa processing to countries like the USA, the UK, Canada, Australia, South Africa, Dubai, Asia countries and Schengen Countries. Zidora Travels & Tours offers world class services like excellent protocol services; air-ticketing, seat reservation and confirmation; visa related services, i.e. providing advice on how to complete visa application form and assist in obtaining them; meetings, seminars and conference planning; family travels and tour packages; schools/youth excursion/holidays; religious pilgrimages; free airport pick and drop for international flights; and hotel reservation. Are you about to apply for visa and you need your documents assessed and to be given professional guide to avoid a refusal? Has your visa application been unfairly refused and you need immediate and positive solution through either appeal, administrative review or a reapplication? Would you like to study, live and work abroad and need school admission, student visa or work permit? Would you like to secure visa to UK, USA, Canada, China, Dubai, South Africa or any Schengen Country? Do you need travel support such as hotel reservation, travel insurance, flight reservation, interview appointment etc? Then think Zidora Travels and Tours and visit www.zidoraconsults.com/testimonies to view success stories of people we have helped to successfully travel abroad. By Dipo Olowookere All is getting.